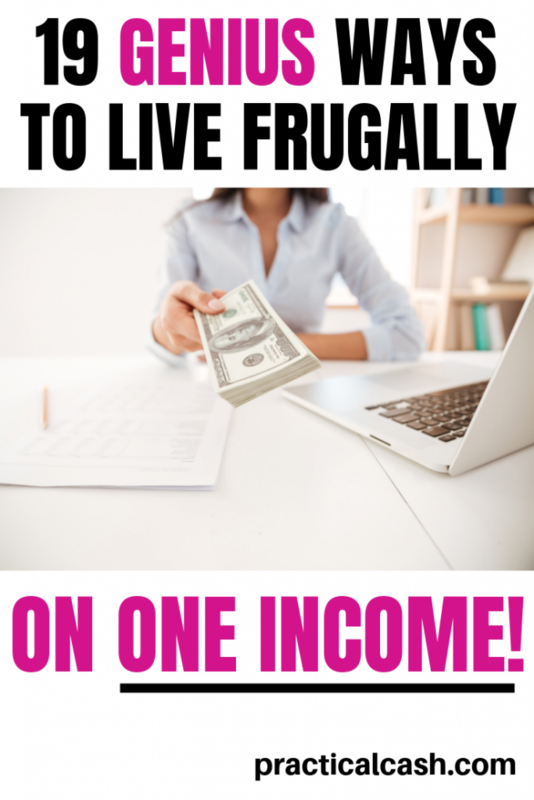 Are you trying figure out how to live frugally on one income? 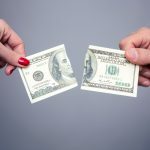 Whether you’re a one income family by choice (because you or your partner is caring for kids or family or home) or by circumstance (because of job loss, unemployment, or disability), living frugally on one income can require some serious black belt frugality. And if you’ve been pinching pennies and pinching them some more, you might feel like there’s seriously nothing left to cut from the budget. Here are a few simple tips you can use to live frugally on one income. Any one of these strategies may not make a huge difference in your budget, but stacking them together will give you some financial breathing room. 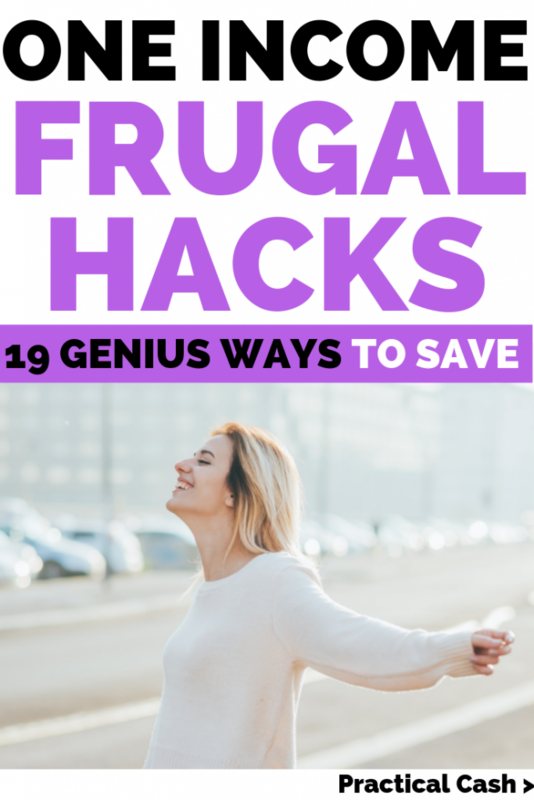 These frugal hacks might save you enough to pay bills or even add to your savings! #1 – Download Ibotta and submit your receipts every time you grocery shop. #2 – Make a meal plan on Sundays (or Fridays, or the day before whenever you shop). #3 – Fire up your printer for coupon savings. #4 – Get 15% off stuff you use everyday. #5 – Dump bottled water. #6 – Replace disposable items you have with reusables. #7 – Swap services for DIY by insourcing. #8 – Cut budget categories you can live without. #9 – Remind yourself to get cash back. #10 – Start loving your local thrift store. #11 – Put your budget on your phone. #13 – Find one thing to sell. #14 – Switch to a prepaid cell phone plan. #15 – Change your old lightbulbs to LEDs. #16 – Eliminate modem/router charges. #17 – Leave your wallet at home. #18 – Post a list of free things to do on the fridge. #19 – Free up cash by canceling subscriptions. No clipping coupons needed! If you’ve never used Ibotta, it’s easy to save anywhere from $1 to $5 every time you grocery shop. Simply download the app to your smartphone, add any offers for the stores in your area. Once you get home from the store, take a photo or two of your receipt and you’ll automatically get your savings credited to your Ibotta account. Once you hit $20 savings, you can have the cash deposited directly to your Paypal account or get equivalent Amazon or other retailer gift cards. Every penny counts when you’re trying to live frugally on one income so check out Ibotta by clicking here today! Even if you’re a fly-by-the-seat-of-your-pants kind of cook, a meal plan is a super savings tool. Without it, you end up running to the store multiple times in a week for things you forgot. And you end up spending more overall because every time you’re in the store, you’re liable to make impulse purchases. A meal plan and frugal grocery budget doesn’t have to be super complicated. Some people like spreadsheets with ingredients and recipes. Some people handwrite a plan for a month. I simply list out the recipes I want to make and my grocery list on a Word document a week at a time. Take into consideration ingredients you have on hand that need to be used up so you can avoid food waste. Some frugal ninjas use spreadsheets that include the prices of meal ingredients. I learned how to meal plan using this book. Check it out online or at your local library. Learning how to make and stick to a budget meal prep plan is a definite game changer if you’re trying to live frugally on one income. Download your grocery store’s digital app (just look for your grocery store in the app store – a lot of times you’ll get a coupon just for adding your email address/phone). Load all the coupons online before you shop. Then, show your card at the register and you’ll automatically receive money off for products you buy. Search for brand name products you’ll buy in a coupon database (I recommend Southern Savers Coupon Database) before you go to the store. For example, I only use Sensodyne toothpaste. Before I buy it, I search for a printable coupon – often, I can find one for a $1 off for just the cost of printer ink. This works great for items you are brand loyal to. If you have an Amazon Prime account (sign up for a free 30-Day trial here), don’t forget to save 15% automatically by using Subscribe & Save. It’s just about the easiest thing you can do to save cash every month. Simply subscribe to at least five items you regularly buy on Amazon (stuff like coffee, diapers, pet food, vitamins, and protein powder are great options for Subscribe & Save) and you’ll save 15% every time you order. Easy way to save money on your budget. Do you have well or city water that tastes bad? If so, you’re probably spending $15-20 a week on bottled water, plus wasting tons of environment crushing plastic in the meantime. Time to investigate some more frugal options if you’re trying to live frugally on one income. 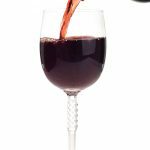 A pitcher or sink water filter (I like this popular filter pitcher and this sink water filter) will solve your issue and help you drink more (& better tasting water). Eliminating single use items and replacing them with reusable products stretches your one income budget. Plus it’s great for the environment. Need to free up some cash in your budget? Look at every service you’re paying for if you’re living that one income life. Since you probably have more time than dollars, you can invest it into saving money. Sometimes this process is called insourcing. If you’re unsure how to DIY a task, don’t forget to check out Youtube for tutorials on common do it yourself projects. 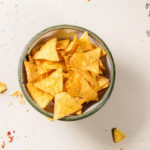 But some budget categories – entertainment, alcohol, eating out – COULD be totally eliminated if you had to go hard-core and save money on a tight budget. Totally stopping all unnecessary can be grueling and may not be forever. But in a pinch, you could save some extra cash by practicing austerity measures. That way there is literally no way to forget to get your cash back because a pop-up will appear every time you go to a site that earns you cash back. Want to know more about Ebates? Here’s our review of Ebates. If you’ve never tried shopping at your local thrift store, prepare to be amazed. The prices are so good you might never want to stop! There’s seriously no need to pay mall or online prices unless you’re an unusual size. And if you have growing kids going through sizes very quickly, you’ll appreciate that you can clothe them for a fraction of the price. Keep an eye out for family or church clothing swap events, Just Between Friends sales, or trade stores such as Once Upon a Child. That way you can trade in your old clothes and get the new ones you need for no or low cost. Have you ever sweated bullets over a budget and then never looked at it again? Yeah, me too. I finally learned the best frugal tip of all – make the budget and keep it on a handy app. That way it’s constantly available to remind you that you already spent the $50 you allotted for entertainment this month. Or that you’ve used up your hair money for the month so you’d better reschedule your appointment. You Need a Budget (YNAB) offers an awesome budgeting app, and that’s the one I use because I really love their software. A budgeting app created by the Dave Ramsey team (check out some of his must-read books here) called EveryDollar is free and highly recommended! Sticking to your budget is critical if you’re trying to live frugally on one income. If you’ve never done it before, investing can be intimidating. Until a couple of years ago, I was seriously intimidated by the entire process. We were investing in a college fund for my son and a Roth every month, but I had no idea what fees we paid or even what our returns were year after year. Fortunately, I read somewhere about the concept of financial independence and investing enough funds so that someday you don’t have to rely on a job for pay – you can live off of your investment returns. Today, there are very helpful microinvesting apps that make it dead easy to begin your investment journey to financial independence. The best one is Acorns – you simply sign up and when you make purchases, the amount is rounded up to the next dollar – and the difference is invested. Seriously, are you going to notice if your coffee at Starbucks is rounded from $3.87 to $4.00? Nope. It might even make budgeting easier. And that $0.13 is now working for you because it’s invested in the stock market. Check out Acorns to start your investing journey! Look around your house. Do you have old working smartphones in a drawer? Are you using those clothes with tags hanging in your closet? To make your one income stretch, check out the Ebay or Poshmark apps. If you have clothes or beauty items to sell (even kids’ and mens’ clothes), Poshmark is probably your best bet. You can make an account (posh credit here) and snap some photos on your phone. Within 10 minutes you can have your item listed for sale. Ebay is a great selling option if you have vintage or hard-to-find items. Don’t hesitate to make some money from your unwanted items. And here’s another tip – selling stuff from home is a fantastic way to make money online. Here’s a list of 50 easiest things you can sell online if you’re trying to live frugally on one income. TIP: Right now, you can get a free $5 to get started on Poshmark? Simply download the Poshmark app in your phone and enter ” berklanstyle ” as the personal invite code. You won’t get the $5 unless you use the code, though, so be sure you enter it when you download. It’s super easy. If you haven’t investigated prepaid cell phone plans lately, definitely check them out to save money on one income. A few months ago, we were paying $150 a month for three (paid-for!) phones and 2 GB of data with AT&T. We made the switch to the prepaid carrier Mint Mobile, and now spend under $60 for better data and coverage. What I love about Mint Mobile is not only could we port all our numbers very easily (no need to update all my contacts and accounts! ), but we could check their coverage maps before we switched so we knew we wouldn’t drop calls. If you’re interested in whether Mint Mobile would help free up some income in your budget, check them out here. You can also order Mint Mobile through Amazon here. Switching out traditional lightbulbs for LED can slash your electricity costs – typically, you’ll cover the expense of the bulbs within a few months in electricity savings. Look for a sale or buy in bulk (here’s a link to them on Amazon) and watch your electricity bill drop. Have you ever looked at your internet bill? Utility companies may be charging you monthly to “rent” the modem or router in your home. Look for a great deal on a new router and within a few months you’ll have paid for it with the savings on your bill. This is a top selling router that is Wifi enabled and is certified to work with Alexa. Do you have a tendency to impulse spend when you leave the house, even if you don’t intend to? That gas station soda and food cart taco can add up. Stick to your single income budget by leaving your wallet at home when you head out and won’t need to spend money. Or take only the cash you’re willing to spend to stop impulse purchases. 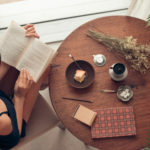 Check out 11 Books to Read During a No Spend or Save Challenge and I Have No Money: Top 6 Tips for a No Spend Money Challenge. Battle boredom and budget breakdown by being proactive about activities. Brainstorm a list of free things to do on your own or as a family and post it prominently on the fridge. Next time you’re tempted to hit the movies or eat out at a restaurant, turn to the list for fun things to do that don’t cost money. One way you can stop wasting money and improve your finances is by automating your finances with a trusted company called Trim. Trim makes it easy to find extra money to pay off debt since they automatically work with your service providers to get you the best rates. And what if you didn’t have to call each subscription you have to save money? Outsource the pain of recurring bills by signing up with Trim. Do you have any money-saving tips for living frugally on one income? Let us know in the comments!